Update (2012-09-06): After some trial and error, it seems the Canon Hack Development Kit (CHDK) component is causing the issue. If you’re experiencing the same problem, try removing this component. Update (2012-09-05): The FastPictureViewer support team was unable to reproduce the issue, but suggested it might have something to do with the JPEG Auto-Rotate feature. I was able to resolve the issue by installing only the following components of the codec pack: Photoshop PSD, Lightroom Previews, Adobe DNG, Canon CR2, CRW, PDF Thumbnails and Control Panel. This suggests one of the other components was causing the conflict on my machines. I use the FastPictureViewer Codec Pack for viewing DNG images in Windows Explorer, amongst other things. Unfortunately, however, installing version 3.3.0.69 of the codec pack in Windows 8 (64-bit) caused my installations of Visual Studio 2010, Visual Studio 2012, Blend 4 and Blend for Visual Studio 2012 to stop working to various extents. Both versions of Blend crash silently. 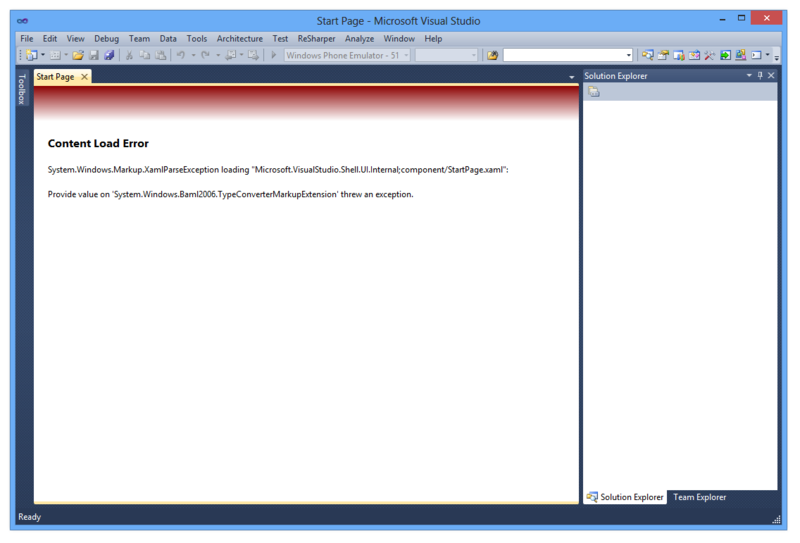 The start pages in both versions of Visual Studio fail to load, with VS2010 displaying a ‘Content Load Error’ relating to ‘System.Windows.Baml2006.TypeConverterMarkupExtension’ throwing an exception. 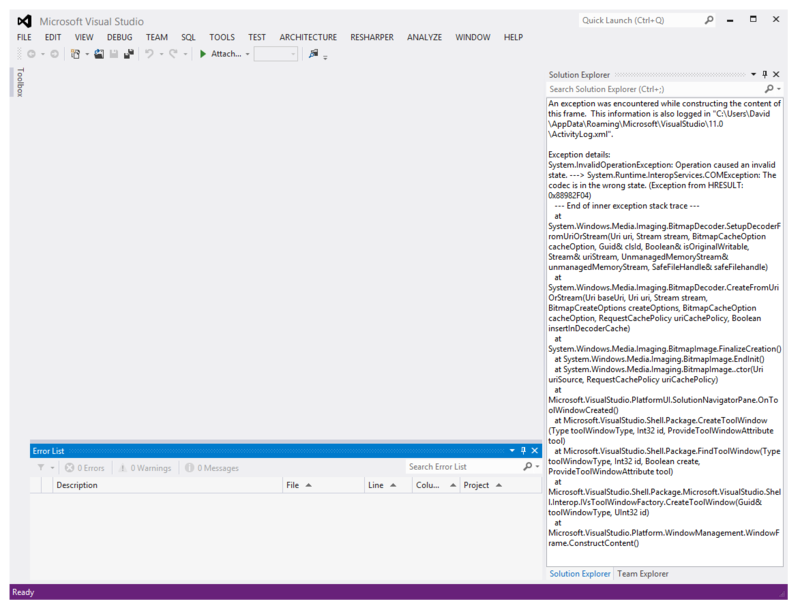 The error message displayed where the Visual Studio 2012 Solution Explorer belongs was more useful: ‘System.Runtime.InteropServices.COMException: The codec is in the wrong state. (Exception from HRESULT: 0x88982F04)’. Uninstalling the codec pack caused everything to start working again. I’ll update this post if/when a future release resolves the incompatibility. I ran into exactly the same problem with a combination of FastPictureViewer 1.9.267.0 (standalone, no codec pack installed! ), Windows 8 and VS2012. 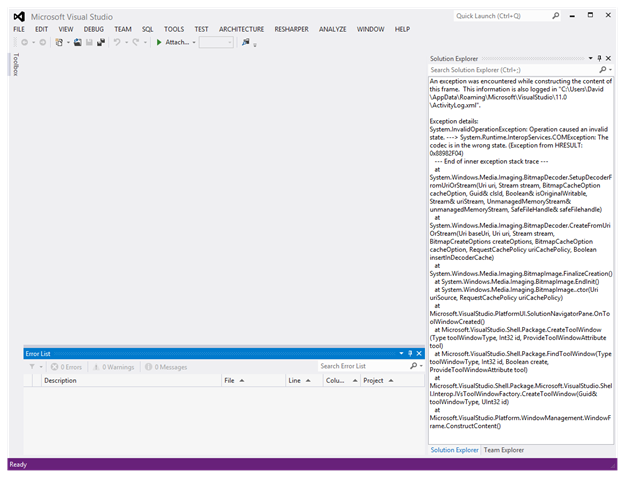 Unfortunately I didn’t make the the connection between .NET’s BitmapDecoder class and FastPictureViewer. Thanks a bunch for posting this. You saved me from a completely pointless VS reinstallation. Glad I could help. I formatted my machine out of frustration before I figured out what was causing the issue. It might be worth shooting [email protected] an email letting them know you’re experiencing the same issue, as they are unable to reproduce it. Thank you. Windows Aero stopped working on Windows 7 (possibly after installing RDP 8.0 from Windows Update). When Launching Diskeeper I got message HRESULT: 0x88982F04, found your post, uninstalled FastPictureViewer Codec Pack, and now Windows Aero is working. Without your post I would have stood no hope of sorting this problem. Support at Firetrust’s Mailwasher Pro (which also stopped working with the message System.Windows.Baml2006.TypeConverterMarkupExtension’ throwing an exception) directed me to this post. I deleted FastPictureViewer version 2.3 and the problem was solved. A couple of hours later, feeling a bit bolder, I reinstalled the latest FastPictureViewer version 3.4.0.76 (28th Feb 2013) and got my RAW thumbnails back without any of the previous problems. Fingers crossed. Thank you for providing the information and solution to this obscure problem. I would have been lost without it. Thanks for this post. Updating to the latest version of FastPictureViewer Codecs solved the Aero-disabled problem for me. I cannot now determine whether the Aero-disabled problem started with RDP 8.0 installation, or with the installation of the Windows 7 Platform Update, which is a pre-requisite for Internet Explorer 10. But updating the FPV Codecs fixed it. And it was finding this post that pointed me in the right direction. Thank you. Even my close, maximize, and minimize buttons were not showing in office! I was about to format my PC. I’ve put up with it for so long, a lot of my .net apps just failed to install or start. Uninstalled that one codex pack and all is well. I am crying with happiness right now. Many thanks for the solution. Unistalling the codec pack worked for me. I was searching for a solution since the new plattform update (KB2670838) for Win7 came out. It’s a combination of the plattform update and the codec pack. If both are installed you get the Visual Studio 2010/2012/2013 error. If you uninstall one of them every thing is ok. So again many thanks for this finding.